1 Every so often the Moon or Sun is obscured in shadow, providing an excellent show for those of us lucky enough to watch. However in the past these same dark shadows struck fear in the minds of ancient civilizations. These events are called eclipses and we now know that an eclipse is a beautiful but rare event. Even rarer is a total eclipse in which either the Sun or Moon is completely covered. Understanding the science behind these events is an interesting quest. 2 Every time the Earth and Moon block the path of the Sun's rays, they cast shadows millions of miles into space. When the Moon comes between the Earth and the Sun, a solar eclipse can be viewed by observers on the Earth as it passes through the Moon’s shadow. On the other hand, when the Earth comes between the Sun and the Moon, a lunar eclipse can be viewed by observers on the Earth as the Moon passes through the Earth’s shadow. 3 The intensity of an eclipse depends on what part of the Moon’s or Earth’s shadow you view. There are two parts to these shadows. They are called the umbra and the penumbra. The umbra is the completely dark portion in which all the incoming light is blocked. It is surrounded by the penumbra in which the shadow blocks only portions of the incoming light. 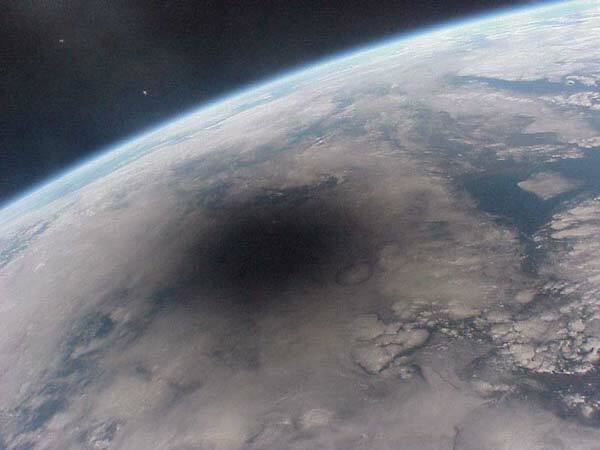 As stated earlier, in a solar eclipse the shadow of the Moon is cast upon the Earth. Various parts of the Earth are covered to a different extent. People covered by the penumbra will see a partial eclipse of the Sun. Those inside the umbra will see a total eclipse of the Sun. 5 It is important to note that the illustration shown above has been drawn greatly out of proportion. To give you a feel for the enormous size differences involved, the center of the Sun is 92 million miles away from the center of the Earth while the width of the Moon's shadow during a solar eclipse can be no larger than 167 miles. This extraordinary dichotomy in range (roughly 55,000:1) makes it impossible to draw diagrams to scale and still make them useful. 6 The Moon circles the Earth at least 12 times during a year. So, why do eclipses happen so rarely? To answer this question, we must first examine two of the Moon's phases and the tilt of its orbit. As the Moon circles the Earth, different portions of the Moon’s surface reflect Sunlight back towards the Earth; so what we call "Moonlight" is actually reflected Sunlight. The Moon's phases depend upon its relative position with respect to the Earth and the Sun. During a full Moon the side of the Moon facing the Earth is completely illuminated. During a new Moon the side of the Moon visible from Earth receives no Sunlight and is completely dark. Since the Moon circles the Earth at a five degree slant from the Earth-Sun plane, the Earth, Moon, and Sun rarely come into exact alignment. Based on our knowledge of solar eclipses, they can take place only when the Moon is in its new phase and its shadow can fall on the Earth’s surface. Furthermore, a lunar eclipse can occur only when the Moon is in its full phase and the shadow of the Earth can fall on its surface. If we number the positions on the above diagram clockwise from the top, a solar eclipse is illustrated in the 4th picture when the shadows of the Earth and Moon align and the Moon is in its new phase. The 3rd picture shows how the 5º slant between the Earth-Sun plane and the Moon's orbital plane causes the shadows to be out of alignment. A lunar eclipse is illustrated in the 1st picture when the shadows of the Earth and Moon align and the Moon is in its full phase. It is interesting to note that once the Earth and Moon are in the same plane as the Sun it is typical for both a solar and a lunar eclipse to occur within two weeks of each other, the amount of time necessary for the Moon to move from its new to full phase, or half of a lunar month! 8 Lunar eclipses often appear red. This is because the Earth’s atmosphere refracts, or bends, the rays of the Sun towards the Moon. It is the same effect that produces red Sunsets, since only the longest wavelengths of light, like red, can pass through greater thicknesses of atmosphere without being scattered. Because the Earth casts a bigger shadow than the Moon, lunar eclipses can be viewed by people throughout an entire hemisphere, not just from the limited area typical of solar eclipses. No matter where you are on the globe watching eclipses is enthralling. The nice thing about lunar eclipses is that they are always safe to look at and fun to watch. Solar eclipses, on the other hand, are dangerous to watch since looking directly at the Sun can cause serious damage to your vision. One method of viewing a solar eclipse is to use two pieces of cardboard. Start by punching a pinhole in one. Then, with your back to the Sun, hold up the piece of cardboard with the hole above your head and place the other piece behind it. When your angles are correctly aligned, the rays of light from the eclipse will pass through the hole and be projected onto the lower piece of cardboard. In this way you will be able to view the eclipse safely. 10 Now that you have a better understanding of the science behind eclipses, no fear should accompany the passage of their shadows. A solar eclipse can occur only when the Moon is in the ______________ phase; a lunar eclipse can occur only while the Moon is in the ________________ phase. 2. A. the rarity of lunar and solar eclipses. B. why the Moon circles the Earth 12 times during a year. C. the fact that lunar eclipses often appear red. D. why solar eclipses are seen during the day, while lunar eclipses are viewed at night. In paragraph 5, it is given that the ratio of distance between the Sun and Earth to the width of the Moon is roughly 550,000:1. If you were to try to draw a diagram to scale of a solar eclipse, and the width of the Moon was to be represented by 16.7 millimeters, what would be the approximate distance from the center of the Sun to the center of the Earth? In the eclipse diagrams, a pair of intersecting lines is formed by the lines that ultimately make up the outer boundaries of the penumbra. If the angle at which these lines meet is 37 , find the measure of the marked angle in the figure below. D. The value of x cannot be determined from the given information. In the following sentences from the paragraph 9 in the passage, what does the word enthralling mean? Which of the following would NOT be a possible reference source for finding information on the causes of lunar eclipses appearing red? Which of the following is the best choice to explain why people of ancient civilizations might have been fearful of an eclipse? Having shadows fall over normally lighted celestial objects would be frightening to people who don’t understand the science behind an eclipse. Some ancient people had superstitious beliefs that darkness indicated death or a curse from the gods. 7. A. Neither I nor II are acceptable reasons. B. Both I and II are acceptable reasons. C. I is an acceptable reason but II is not. D. II is an acceptable reason but I is not.